Posted on December 2, 2014 by On a Higher Note. David Solomon and Pal Bratelund from TIDAL came by during Rocky Mountain Audio Fest and installed WIMP on my notebook computer so I could test drive TIDAL ahead of its launch. TIDAL offers full CD quality streaming using either FLAC (Free Lossless Audio Codec) or ALAC (Apple Lossless Audio Codec) at 16 bit/44kHz and at a bitrate of 1411kbps (versus Spotify premium is 320 kbps). I actually tested the service in a few ways:First blush, I was delighted with its user interface and even though music was still adding to the service as I was testing, it boasts a wide selection of 25 million songs, something I am excited about. Loading some of my Demo CD titles into my playlist was a breeze (although I did holler for help as some titles were there but hard to find). We then decided to put TIDAL to a “road test”. When my son and I were driving home from L.A., we did a comparison between streaming music from his phone on Spotify premium versus from my phone with TIDAL. Verdict? We could clearly hear the better sound quality from TIDAL even over the car stereo. Then all I could think of was to put TIDAL to a test on our familiar Luxman systems to see if we can hear the difference. Before I could do that, I was getting exciting feedback from our dealers who have embraced TIDAL reporting great sound and convenience using our Luxman’s D-100r (iPod/iPhone Dock with DAC & RC, Retails $500) paired with either the Luxman’s SQ-N10 (Vacuum tube integrated amplifier with metal RC, Retails $2,000) or other preamp and integrated amp combo. When using an iPhone/iPad compatible device like the D-100r, the nice thing is that you can install the TIDAL app on your iPhone/iPad and stream lossless music into your stereo without a computer hooked up. TIDAL streams via Android off a computer also as long as you have an Internet connection. While there was a slight latency when I initially chose the songs as it clearly needed to load those into a buffer, once that’s done, I had not encountered any glitches. – Playing off a playlist from your computer or a device is pretty immediate. The other benefit from TIDAL is clearly demonstrated by my experience with Bryan Ferry’s Avonmore. While I have ordered the LP, as of this writing, it still has not arrived (released after the CD). Meanwhile, I have been streaming the file from TIDAL for the last few weeks and have been delighted with the album. Same as the new Damien Rice album. In short, whether you play it off a small system like the Luxman SQ-N10DR combo I have in my office or on a big system like some of our dealers do, for those who want background music where you work, read, for not so serious listening or if you just want to incorporate music into your lifestyle, TIDAL is definitely your answer. 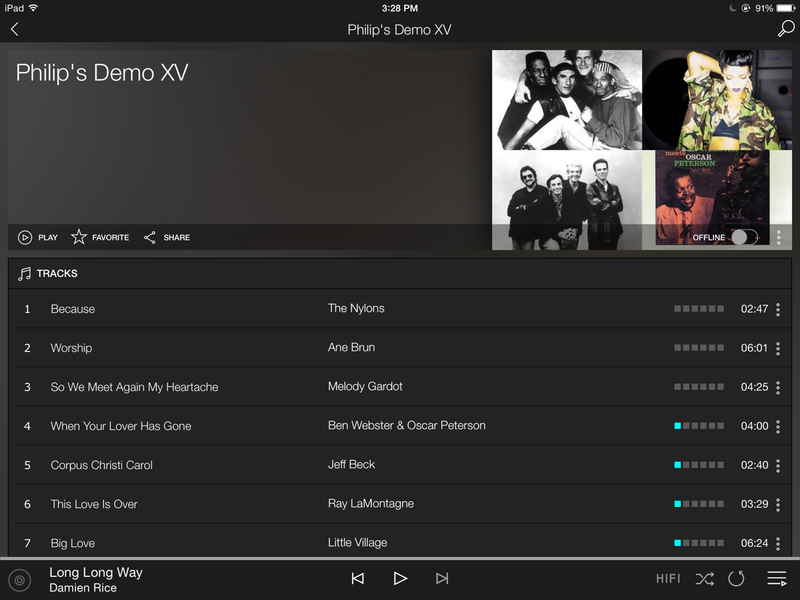 The only caveat about the office system is that the iPod4 and iPhone4 won’t work with TIDAL. Only the 5’s and 6’s with a lightning connector works. Using our D-100R, I just added an apple 30-pin lightning adaptor. In one sentence, big hearty thumbs up to TIDAL. Contact us or your authorized dealer for an audition of TIDAL with the Luxman sound. This entry was posted in Latest News and tagged Luxman. Hey, I just love this app. The best thing is that it is compatible with iphone.